Frank Sinatra’s artistic career is completely unique and practically unrivaled. Sinatra reached the top of the music industry, Hollywood, Broadway, Vegas and just about everything else he undertook. He has been honored as an actor, singer, arrager, and humanitarian with awards including the Golden Globe, the Oscar, countless Grammys, and a Kennedy Center Honors. 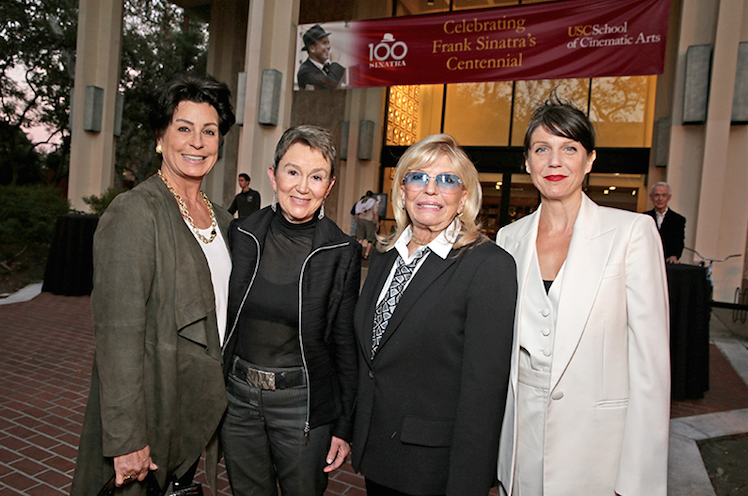 As Frank Sinatra reaches the centennial mark (Sinatra was born in 1915), his daughters Tina and Nancy and the Frank Sinatra Family Foundation are honoring his memory by creating the Frank Sinatra Endowed Fund for Student Support at the USC School of Cinematic Arts. To honor this gift and Sinatra’s incredible mark on world culture, SCA, the Visions and Voices initiative at USC, SCA Dean Elizabeth M. Daley, and the Sinatra family hosted A Centennial Celebration of Frank Sinatra, a series of screenings and talks culminating in a presentation on Frank Sinatra’s work by Alma and Alfred Hitchcock Professor Drew Casper followed by a Q and A with Tina and Nancy Sinatra on November 8th in Frank Sinatra Hall. The evening began with a multi-media presentation from Professor Casper which covered Sinatra’s humble beginnings, his early days as an RKO player, his rise in the music industry, his rough days in the early sixties, and his life at home. Following the presentation, Nancy and Tina Sinatra discussed their personal life with their father and answered questions from the audience, many of which took the form of thank yous from people whom Frank Sinatra had personally touched with his generosity while alive. Sinatra had success as a big band singer, a serious actor, a dancer (who held his own with Gene Kelly), and even an acrobat. In fifty-three films, he covered comedy, drama, musical, and spanned tones from light hearted romp Ocean's 11 to incredibly serious melodrama The Man with the Golden Arm. His singing career was just as versatile spanning from big band crooning to novelty pop hits sang with daughter Nancy. In addition to his life as an artist, the evening highlighted Sinatra’s contributions to racial equality and compassion as a father. Sinatra’s contribution to human rights is perhaps best remembered by his breaking of the color barrier with his “rat pack” shows in Las Vegas but he was also an advocate for racial rights in films including his role in Kings Go Forth where he played an Army officer standing up to racism among the ranks of his fellow soldiers. The School of Cinematic Arts will continue honoring Sinatra with contributions to the Sinatra Family Endowed Support Fund. For more information, please visit sinatra.usc.edu. "My father believed that an education was the greatest gift in the world,” said Tina Sinatra. “For him, an educated person was not only our best defense in suppressing prejudice and hatred, but a supreme instrument for instilling creativity and inspiration for generations to come."